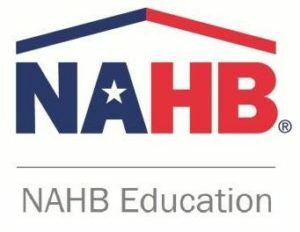 NAHB Education offers professional development programs to building industry professionals nationwide that enhance their business savvy, broaden their areas of expertise and increase their marketability. In today’s evolving market, it’s more important than ever for building-industry professionals to maintain their competitive edge. Professional designees stay up to speed on the latest developments in business, building methods, and technology while showing clients they have the know-how and dedication to earn a professional designation. Potential clients can use designations to help identify and select professionals with superior training, real-world experience and in-depth knowledge of their area of need. Designees are listed in The Professional Designation Directory on nahb.org, making their contact info easily accessible to consumers. Access to real-world information and great leadership opportunities are benefits typically mentioned by designees. However, graduates also routinely express that the chance to network with expert instructors and their peers is a huge plus. Students develop a nationwide network of colleagues that they consistently return to as sounding boards for challenges and ideas long after their courses have completed. This chance to network with so many fellow industry pros often brings people back to obtain more designations. Earning a designation from NAHB is hard work and the rigorous coursework is continually being elevated. Still, according to NAHB, builders and remodelers are as eager as ever to enroll. NAHB’s commitment to offering industry professionals the best, most-extensive continuing education program is evident in the diverse array of programs. Most designations cover industry basics such as marketing and business techniques, however, specialized coursework includes aging-in-place remodeling, property management, green building and more. Through NAHB Education, industry pros can earn professional designations in any one of 13 areas. Chuck Miller has earned 9 professional designations. Professional home builders who nationwide to attain the Graduate Master Builder (GMB) designation are the home building industry’s top professionals. After earning the GMB, program graduates are required to sign a code of ethics and maintain their designations by completing 12 hours of continuing education every three years. Home builders who have earned the National Association of Home Builders’ Certified Graduate Builder (CGB) designation are some of the industry’s top professionals. Experienced builders can be even better with the Certified Graduate Builder (CGB) educational designation. You’ll sharpen your business management skills and better understand today’s home building industry. CGB courses focus on effective management in the office and on the job site, examine all stages of new home construction and cover topics such as scheduling, estimating, job cost procedures, accounting principles and basic contract law. When NAHB surveyed CGB designation holders, the association found that their revenues were significantly higher than companies of the same size but without CGB leadership at the helm. That’s because the home builders who seek the CGB are dedicated to their craft and to growing their business – and that is evident by their commitment to continuing education. Are you ready to get started? First, you’ll need to take the Builder Assessment Review so NAHB can tailor an educational program that capitalizes on your strengths. The BAR is the first step toward earning the Certified Graduate Builder (CGB) designation, which emphasizes business management skills as the key to successful builder operations. You do not pass or fail the BAR. Your knowledge of the five topic areas are assessed to determine where you need more education to meet the knowledge criteria required to earn a CGB. Results are derived from the number of questions answered correctly and indicate a value of 0, 1, or 2 which is the number of courses required to complete the CGB designation requirements for that subject area. Scores include statistical adjustments to equalize the difficulty of passing all forms of the BAR. You are not penalized for guessing but are encouraged to answer all questions to the best of your ability. The BAR is an online, timed, three-hour online assessment. It should be taken from a desktop or laptop with a secure Internet connection. The assessment cannot be accessed via a mobile device or tablet. You can only take the BAR one time. The BAR costs $95. Click here to register..
Don’t wait too long to get started: Enjoy the benefits of the CGB as soon as you can! The Graduate Master Remodeler (GMR) professional designation is held by a select group of building industry professionals: applicants must have at least 15 years of remodeling experience before they are even eligible to be considered for the designation. This program is designed to be the master level of the current Certified Graduate Remodeler designation and requires completion of five additional courses, and having an active CGR for five years or active CR (Certified Remodeler) from NARI (National Association Remodeling Industry) for 10 years. Home owners seek GMRs because they know that these are remodelers who know how to run a successful business, keep up with current design and style trends and listen well to their clients. Remodelers and home builders who have earned the National Association of Home Builders’ Certified Graduate Remodeler (CGR) designation are some of the industry’s top professionals. The Professional Remodeler Experience Profile (PREP) is the first step toward earning the Certified Graduate Remodeler (CGR) designation. The PREP is a multiple-choice assessment with 150 questions that touch all aspects of the remodeling business which emphasizes business management skills as the key to a professional remodeling operation. The assessment includes five sections. Business Management: financial planning, budgeting, job cost and accounting. Project Management, including site management and quality control. The PREP is an onlime timed, three-hour assessment. We recommend that the assessment be taken from a desktop or laptop with a secure Internet connection. The assessment should not be attempted via a mobile device or tablet. The PREP costs $95. Click here to register. Don’t wait too long to get started: Enjoy the benefits of the CGR as soon as you can! NAHB places great emphasis on doing business with a member: Builders and remodelers are encouraged to work with contractors and suppliers who share their commitment to the home building industry and to their home building association. NAHB Associate members are those professionals who work in the home building and remodeling industry but in supporting roles: the bankers, lumber dealers, engineers, real estate agents and others who make the materials and provide the services that make home building possible. Associate members who wish to set themselves apart from their peers often go for their Certified Graduate Associate (CGA) designation. The CGA curriculum helps these professionals gain a better understanding of the industry they serve from the best source possible: builders and remodelers with years of field experience. The CGA designation affirms your level of industry knowledge and your commitment to your professionalism in the building industry. Building industry professional who earn the Certified Aging‐in‐Place Specialist (CAPS) designation are a select group of professionals nationwide with the skills and knowledge necessary to remodel or modify a home to meet the unique needs of the older population, disabled owners or their visitors. The National Association of Home Builders, in partnership with the AARP and Home Innovation Research Labs, created the CAPS program, which includes training and education on the technical, business management and customer service skills essential to compete in the fastest‐growing segment of the residential remodeling industry — home modifications for aging‐in‐place. The Certified New Home Sales Professional (CSP) designation is the first designation available through the National Association of Home Builders Institute of Residential Marketing (IRM) . CSP was designed for specialists in new home sales to enhance their professional image, increase their marketability in the home building industry and sell more homes! Master the craft of successful selling and launch your new home sales career with the Certified New Home Sales Professional (CSP) educational designation. Taking the required classes in person or online, you’ll gain a broad understanding of the home building industry, better understand today’s consumers and learn tried-and-true techniques used by real estate veterans for greeting prospects, overcoming objections and closing the sale. The CSP designation is also your introduction to the Institute of Residential Marketing, which awards a series of four sales and marketing designations for professionals at all stages of their careers. NAHB Master Instructor Chuck Miller is a Certified New Home Sales Professional (CSP). Certified New Home Sales Professionals with sufficient experience in the field may be ready to take the next step in their professional development with the Master Certified New Home Sales Professional (Master CSP) designation. Course requirements include an additional 30 hours of instruction in all facets of the home building industry as candidates choose the courses that reflect their sales specialties, such as green and sustainable building or sales for clients in affordable housing or senior communities. Builders and developers are looking for qualified salespeople. The Certified New Home Marketing Professional (CMP) is a mid-level designation that will help you manage the sales and marketing function of a new home community and boost your career. The CMP designation tells home builders that you’re knowledgeable about new home construction and the advantages of a newly built home so you can present the best case to potential home buyers. You understand how consumers shop today and you’re ready to employ every marketing advantage in your arsenal. Give yourself the sales edge with the CMP and watch your new home sales career take off. NAHB Master Instructor Chuck Miller is a Master in Residential Marketing (MIRM). The Housing Credit Certified Professional (HCCP) is a specialized designation for developers, property managers, asset managers and others working in the affordable housing industry through the Low-Income Housing Tax Credit (LIHTC) program. To support this one-of-a-kind designation, NAHB publishes a newsletter, the Credential and regularly hosts continuing education events, including webinars on tax law and successful apartment business management.